Why are 2nd amendment people also champions of the police? Discussion in 'Politics & Current Events' started by Hollowway, Mar 23, 2018. There are a lot of things that confuse me about the political views of the the major parties. One is this: those passionate about the 2nd amendment often cite the potential need to defend ourselves against the government. Yet, they are also the same ones to side with cops, and be a “blue lives matter” supporter. When presented with a “unarmed man shot 20 times by two cops (a recent headline in my area), I’m surprised that these guys are fully in support of the police. Why is that? auxioluck, Edika, Explorer and 2 others like this. Because even the mall cop-minded civilians who buy guns to imitate the militarized local police vote against their own interests. As has been pointed out by many, that’s like asking why those who identify as anti-abortion tend to be opposed to LGBQT people who are guaranteed to never have abortions. Bentaycanada, auxioluck, Watty and 3 others like this. Because in the big battle the cops, who have off-time and families and whatnot, will naturally join the rebel forces against the military personnel, who are mindless killing machines and will unquestionably obey whatever orders are given to them -- even those to go after private citizens. Mathemagician, Explorer, Hollowway and 1 other person like this. When presented with a “unarmed man shot 20 times by two cops (a recent headline in my area), I’m surprised that these guys are fully in support of the police. Why is that? Because some people are just kinda dumb. Bentaycanada, StevenC, Masoo2 and 8 others like this. I think another aspect is the "enemy of my enemy is my friend" mentality. You can take a guess who they feel is thier "enemy." Edika, Explorer and vilk like this. possumkiller and ElRay like this. I think another aspect is the "enemy of my enemy is my friend" mentality. ..."
Regarding the 2nd Amendment: It only applies to caucasians. Regarding fear-based, extra-judicial executions: See #1. Caucassin mass murderers are almost always "good kids", or "from broken homes", or "had tough lives", etc. Non-caucassin victims are almost always "thugs", have "anger issues", "imposing", "troubled", etc. Bentaycanada, Mathemagician, Edika and 7 others like this. Likewise it can be said for the other side too. Those that claim to support the right for individuals to own a firearm, but in the same breath also say "but really I wish guns didn't exist, and we should get rid of the 2nd amendment if it means another kid doesn't have to die". They champion people like bernie sanders and other politicians who are surrounded by armed gaurds, and think only the military and police should have guns. Basically, people want their own country to be protected by armed people to protect against an outside threat, yet dont want a right that would allow themselves and others to protect their own home against an outside threat. But there is a flaw in your concern because "cops" are not government. 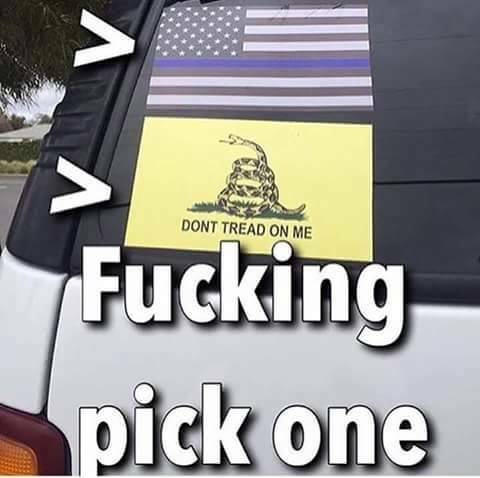 When people talk about protection from government, that doesnt include the police. Government is the FBI, SWAT, Military, Black Water Special Forces, and other federal agents. That being said.....I am a 2nd supporter, however I am absolutley disgusted by what these police officers who are doing wrong are getting away with, and given a slap on the wrist. It's evident that there is a of blind-eye turning going on, and that is corruption to the core. This is supposed to be some sort of catch-22? People claim to want free speech, but yell "Fire!" in a crowded theater and it's a crime! Wake up, sheeple!! Um no. Thats not the same thing. I dont know why you assume that I think your scenario is OK and proper. You tell those bible thumpers!!! It's not the same thing -- it's an analogy. Everything has its proper place. There's nothing surprising that people want soldiers to have guns and don't want just any random neighborhood dude to have one. I agree. Your absolutley right that fatherless homes in communites of "brown skinned" people are a monumental problem! Years ago people would say "my fellow American" or "my fellow neighbor/friend". In 2018 its just some random dude. So Blackwater mercenary contractors are the government but, the democratically elected county sheriff and city police chief are not the government? vilk, Mathemagician and cwhitey2 like this. The phrase "There goes the neighborhood" wasn't coined in 2018. You like your neighbors who are like you, and you don't like the neighbors that have a confederate flag hanging in the garage and turn their entire front yard into a mudpit trying to make some sort of make-shift pool for their children with a backhoe and a garden hose. Wait, I too don't see the contradiction here. I think an interesting implicit thing to keep in mind here, is that the "pro second amendment AND pro cop" thing is potentially unstable, and could change VERY fast. I forget the comedian who joked that if all the black guys in America were to go out and buy guns, we'd get gun control in a hurry, but he was absolutely correct - a sudden uptick in minority gun ownership would strain that pretty badly, I'd think. Then again, I've definitely been guilty of underestimating the ability of conservatives to withstand cognitive dissonance in the past, so who knows. groverj3, Hollowway, Edika and 1 other person like this. I spent three years in Iraq. Most of that time was in the gun turret of a truck. The rest of the time was either in a guard tower or down on the ground standing at the ECP. I was involved in many incidents where I would have been in the clear to outright kill somebody. I am happy that I never had to. I have found in the army that there are different types. There really are people that join just for a chance to kill someone. They are trigger happy just waiting for that moment and any excuse. I am sure there are some of these in the police force as well. groverj3, Hollowway, ElRay and 3 others like this. It's great of you, by applying the "broken homes" from the description of caucasian mass murderers to minorities instead, to let us know your own prejudices.